The Low Hangpoint Kit brings the risers down between 6 and 10 inches from the regular hangpoint attachment. Instead of reaching up quite high to grab the brake toggles, the pilot can now comfortably reach the brake handles located just above the shoulder next to the Power Loops without lengthening their glider's brakes. The distance the risers can be lowered will depend on the particular glider and the distance between the attachment point and the trimmers. 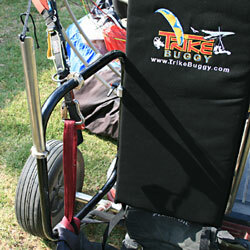 The TrikeBuggy Low Hangpoint Kit comes with a new hang strap that is longer to allow wrapping the loop all the way around both the Power Loop and the side bar of the Kite Buggy, near the pilot's hips. This further binds the trike together at this point, making it even more secure (although we have never had even an indication that our regular redundant clamps and straps here showed any signs of stress or strain). Most gliders made for paramotoring have trimmers for increasing the speed of the glider during flight, but most of ushave to reach up high to apply or release them. With the Low Attachment Kit, your trimmers are now just above the Power Loops where you can easily access them. By lowering the hangpoint and guiding the risers at the Power Loops where the CG (center of gravity) point is for the individual pilot's weight, we stabilize the glider in relation to the trike. This produces less yaw, and less dipping, where the front of the trike "dips" up and down. 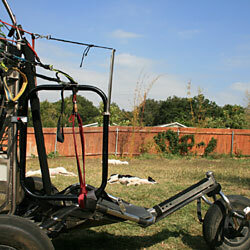 PPC (powered Parachute) manufacturers use an attachment bar instead of the risers we see on paragliders, and this stabilizes the wing on the trike. By lowering the attachment point, we also shorten the "rhythm" of the trike and paraglider, meaning our turns are flatter and more efficient with less swinging. 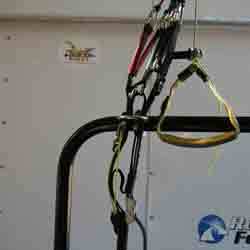 Trimmers for most Paragliders can be positioned either above or below the Riser Guides (see photos).